Research on emotion has considered the pulvinar to be an important component of a subcortical pathway conveying visual information to the amygdala in a largely “automatic” fashion. An older literature has focused on understanding the role of the pulvinar in visual attention. To address the inconsistency between these independent literatures, in the present study, we investigated how pulvinar responses are involved in the processing of affectively significant stimuli and how they are influenced by stimulus visibility during attentionally demanding conditions. Subjects performed an attentional blink task during fMRI scanning involving affectively significant (CS+) and neutral stimuli (CS−). Pulvinar responses were not influenced by affective significance (CS+ vs. CS−) per se. Instead, evoked responses were only modulated by affective significance during hit trials, but not during miss trials. Importantly, moment-to-moment fluctuations in response magnitude closely tracked trial-by-trial detection performance, and thereby visibility. This relationship was only reliably detected during the affective condition. Our results do not support a passive role of the pulvinar in affective processing, as invoked in the context of the subcortical-pathway hypothesis. Instead, the pulvinar appears to be involved in mechanisms that are closely linked to attention and awareness. As part of thalamocortical loops with diverse cortical territories, we argue that the medial pulvinar is well positioned to influence information processing in the brain according to a stimulus’s biological significance. In particular, when weak and/or brief visual stimuli have affective significance, cortico-pulvino-cortical circuits may act to coordinate and amplify signals in a manner that enhances their behavioral impact. The pulvinar complex is the largest nuclear mass in the primate thalamus and its large size is thought to be correlated with the phylogenetic expansion of other visual structures in primates (Grieve et al., 2000). Broadly speaking, there are two roughly separate literatures that have dealt with the pulvinar. Research on emotion has considered the pulvinar to be an important component of a subcortical pathway conveying visual information to the amygdala. The so-called colliculo-pulvino-amygdalar pathway has been proposed to be a component of affective processing and responsible for giving rise to rapid and “automatic” processing of emotion-laden items (de Gelder et al., 1999; Ohman and Mineka, 2001). This proposed visual pathway is suggested to be analogous to a subcortical pathway involved in auditory processing linking the medial geniculate nucleus of the thalamus and the amygdala in the rat (LeDoux, 1996). As described elsewhere, the colliculo-pulvino-amygdalar pathway is purported to function in a way that is independent of attention and awareness (Pessoa, 2005). For example, concerning attention, it has been reported that threat-faces are processed pre-attentively in visual search paradigms (Ohman et al., 2001), and that fearful faces evoke differential amygdala responses even when they are unattended (Vuilleumier et al., 2001), effects that may depend on the proposed subcortical pathway. Concerning awareness, in a well-known study, Morris et al. (2001) investigated brain responses evoked by “unseen” faces, which had been previously aversively conditioned. Increased “functional coupling” (i.e., signal correlation) between the right amygdala, pulvinar, and superior colliculus was observed when fear-conditioned faces were unseen, but not when they were seen. Morris et al. (2001) interpreted their results in terms of a subcortical pathway culminating in the right amygdala, via the midbrain (superior colliculus) and thalamus (pulvinar), thereby providing a route for processing behaviorally relevant unseen visual events in parallel to a cortical route necessary for conscious identification. A second, older literature has focused on understanding the role of the pulvinar in visual attention. Early studies in monkeys and humans with pulvinar lesions suggested that this structure is involved in determining what is important or salient in a visual scene (Ungerleider and Christensen, 1979; Zihl and von Cramon, 1979). Consistent with this notion, the activity of neurons in the pulvinar has been shown to be modulated by attention and/or behavioral relevance. For instance, pulvinar neurons respond more vigorously to behaviorally relevant targets than to unattended stimuli (Robinson and Cowie, 1997). In one study, as many as 92% of the cells exhibited attenuated responses when stimuli were task irrelevant (passively viewed) relative to when they were task relevant (Benevento and Port, 1995). Furthermore, the impact of attention on evoked responses is spatially specific; for instance, it is observed when a monkey attends to a stimulus falling within the receptive field of a cell (Petersen et al., 1985). Finally, the pulvinar appears to be critical when a distractor stimulus needs to be “filtered out,” as suggested by reversible GABA deactivation (Desimone et al., 1990). Thus, it has been suggested that the pulvinar is involved in attention and/or distractor filtering, consistent with neuroimaging and lesion studies in humans (Mesulam, 1981; LaBerge and Buchsbaum, 1990; Corbetta et al., 1991; Karnath et al., 2002; Kastner et al., 2004; Arend et al., 2008). This second literature provides evidence that the pulvinar is important for visual awareness, too. For instance, lesion studies in humans have revealed that pulvinar damage is associated with visual neglect, as well as feature-binding deficits (Zihl and von Cramon, 1979; Karnath et al., 2002; Ward et al., 2002). A recent monkey physiology study is particularly noteworthy. Leopold and colleagues recorded neural activity in the pulvinar during a visual illusion that induced the intermittent perceptual suppression of a bright luminance patch (Wilke et al., 2009). Neurons in the pulvinar showed changes in spiking rate according to trial-by-trial stimulus visibility, suggesting to the authors that visual responses of pulvinar neurons reflected the visual awareness of a stimulus. The above two literatures have progressed in a largely independent fashion, and point to inconsistent views of pulvinar function. On the one hand, the pulvinar is suggested to be part of a largely automatic pathway that is presumed to operate independently of attention and awareness. On the other hand, the pulvinar has been characterized as a structure not only subject to attentional modulations, but also critically involved in attentional functions. Studies are thus needed that address this discrepancy. In the present study, we investigated how pulvinar responses are involved in the processing of affectively significant stimuli. Importantly, we explicitly probed whether stimulus visibility during attentionally challenging task conditions influenced signals in the pulvinar. Subjects performed an attentional blink task during fMRI scanning and were asked to detect two target objects presented among distracters in a rapid serial visual presentation stream. Typically, a subject’s detection of the second target (T2) is significantly impaired when it closely follows the first target (T1) (Raymond et al., 1992), an effect that is decreased when T2 is an affectively significant item (Anderson, 2005). Here, aversive conditioning was employed in order to manipulate emotional significance. Accordingly, the experimental session began with an initial learning phase during which houses or buildings were paired with shock (Figure 1A). During the main experimental runs, a slow event-related design was used, which allowed us to quantify the link between trial-by-trial response magnitude and behavioral performance (i.e., stimulus visibility). Here, we report the results concerning the pulvinar; other findings concerning the amygdala and visual cortex, among other structures, have been described elsewhere (Lim et al., 2009). Figure 1. Experimental paradigm. (A) Affective significance was manipulated during an initial learning phase. In this example, building stimuli were paired with mild shock 50% of the time, while house stimuli were not paired with shock. 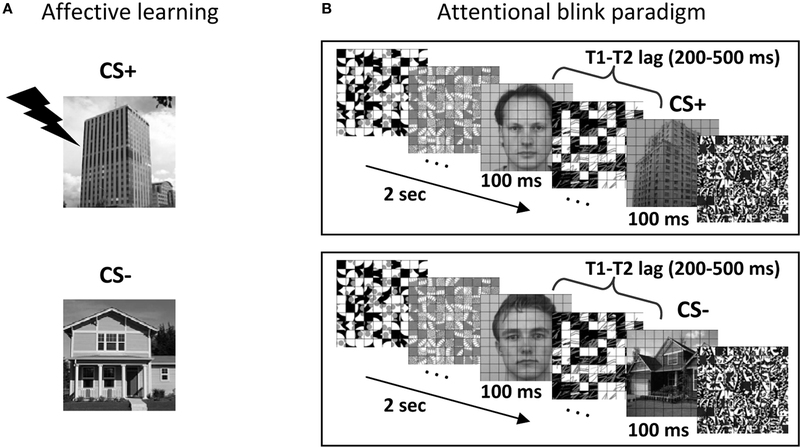 (B) Subjects performed the attentional blink task, which involved reporting two target stimuli (T1: face; T2: scene) among a stream containing 18 distractors. T2 stimuli could be a CS+ (building; top panel), a CS− (house; bottom panel) or a distractor stimulus (not shown). Thirty right-handed subjects (20–34 years old; 15 males) participated in the present study. Two additional subjects were recruited but were excluded from data analysis due to problems during scanning. Of these, one participant with cold symptoms reported some discomfort and needing to hold her breath frequently to avoid coughing; she also reported difficulty focusing on the task. A second participant misunderstood the scene categories and responded “building” for all multi-storied stimuli. All participants were in good health with no history of neurological or psychiatric disorders. Participants had normal or corrected-to-normal vision. A behavioral attentional blink experiment, which was administered prior for scanning, consisted of both single- and dual-task conditions, and was used to calibrate task difficulty for the subsequent fMRI sessions. During the dual-task, participants were asked to search for two targets presented among 18 distractor items in a rapid stream (Figure 1B). The first target (T1) was a face image and the second target (T2) was a scene image. Each item was displayed for 100 ms. The T1 task involved identifying one of three potential target faces (“Andy,” “Bill,” and “Chad”). The T2 task involved a categorization of scene stimuli (house, building, or no-scene). During the single-task condition, the same trial structure was employed, except that the T1 image was replaced with a distractor stimulus and the final T1-related decision display was omitted. This behavioral task lasted approximately 1.5 h and was performed in a mock scanner. As in fMRI sessions (see below), stimuli were presented through an LCD projector at a resolution of 1024 × 768 pixels and a refresh rate of 60 Hz. All stimuli were presented at fixation, subtended 4.5° × 4.5° of visual angle, and were shown in black-and-white on a gray background. The schedule of stimulus presentation and data collection were controlled by Presentation software (Neurobehavioral Systems, Albany, CA, USA). Three neutral face stimuli were selected from the Karolinska Directed Emotional Faces (KDEF; Lundqvist et al., 1998). For scene stimuli, 84 house images and 84 building images were selected. A grid of thin black lines was superimposed on all images, because it made target detection more challenging, as determined during preliminary pilot testing (see also Marois et al., 2004). The T1 face image was displayed 200, 300, 400, 500, or 800 ms before the T2 scene (the T1–T2 lag was randomized). A T1 stimulus (face) was presented in every trial and a T2 stimulus (house or building) was presented in 78% of the trials. For scene-absent trials, an additional distractor image was used to replace the scene image. The response button mapping for houses and buildings was counterbalanced across participants. Participants were instructed to give priority to the T1 task over the T2 task during the dual-task (i.e., T1 and T2) condition. Each trial began with a display of a green fixation cross for 400 ms, followed by the stimulus stream. After the stream, participants were asked to make a T1-related decision (Andy, Bill, or Chad?) during a 2-s response period and a subsequent T2-related decision (House, Building, or No scene?) during a 2-s response period. Dual-task trials occurred every 8 s. For the dual-task condition, T2 responses were analyzed only when the T1 response was correct to ensure proper attentional engagement on the T1 process (Raymond et al., 1992). Single-task (i.e., T2 only) trials occurred every 6 s. Single- and dual-task conditions were performed in separate blocks with randomized order. A total of 960 dual-task trials were presented over eight blocks and a total of 96 single-task trials were presented over four blocks. To familiarize participants with the three face identities labeled Andy, Bill, and Chad, hard copies of printed face images with their names were provided. At the beginning of the behavioral session, subjects performed a short block of a face identity task and a short block of a scene categorization task, during which feedback (correct/incorrect) was provided after each response. After the behavioral session, participants underwent two fMRI sessions (three sessions were administered for two participants who exhibited a low number of MISS trials; see below). The two fMRI sessions were completed within 1 week of each other (typically in subsequent days). For each fMRI session, participants performed 10 conditioning training trials (including 2 that involved electrical stimulation) and 40 dual-task training trials during the initial anatomical scan. The main experimental phase was subdivided into two phases, learning and attentional blink. During the affective learning phase (Figure 1A), differential fear conditioning was employed as a manipulation of the affective significance of scene stimuli. During this phase, participants performed a two-choice scene categorization task (house or building?). House or building images were designated as the CS+ category and mild electrical stimulation served as the US (the CS+ category was counterbalanced across participants). During conditioning trials, images of CS+ scenes were followed by a US according to a 50% partial reinforcement schedule. The US shock was administered to the distal phalange of the third and fourth fingers of the non-dominant (left) hand through a stimulator (E13-22; Coulbourn instruments, Whitehall, PA, USA), which included a grounded RF filter, and MR-compatible leads and electrodes (BIOPAC systems, Goleta, CA, USA). At the beginning of the MRI experiment, subjects were explicitly instructed of the contingency rule (i.e., the CS+ scene category), but were not informed about the probability of US delivery. The intensity of the “highly unpleasant but not painful” electric shock (range: 0.6–4.0 mA) was set for each participant individually while he/she was prepared for MRI scanning. The subjective aversiveness of US shock was monitored between the functional runs via the intercom system and the intensity of stimulation was re-adjusted if needed. On each conditioning trial, images of scenes (without the superimposed grid) were displayed for 2 s and followed by an 8-s fixation cross. Thirty-six scene images were displayed at the center of the display in random order with the constraint that no more than two buildings or two houses were presented successively: 12 CS+ scenes without shock (CS+), 12 CS+ scenes paired with shock (CS+ with US; thus CS+ scenes were paired with shock 50% of the time), and 12 CS− scenes. The US was delivered 1500 ms after the onset of a CS+ stimulus and co-terminated with the CS+, following a delayed conditioning paradigm. All trials involving electrical stimulation were discarded from further analyses. After fear conditioning, participants performed dual-task trials (i.e., the AB paradigm), which were identical to those during the behavioral session, except that a slow event-related design was employed with trials occurring every 14, 16, or 18 s. For each participant, the initial temporal lag between the first and second targets was individually set to the lag that yielded 60–65% accuracy during the previous behavioral session. Performance during the fMRI session was monitored on a per-run basis and task difficulty was further calibrated (via changes in T1–T2 lag) to maintain T2 detection accuracy around 60–65% for the CS− condition. Across two fMRI sessions, participants finished a total of 24 dual-task runs (36 runs for two participants with three fMRI sessions). Unless otherwise noted, all stimulation parameters were identical to those employed during the behavioral session administered in the mock scanner (including projector type). A total of 168 CS+ dual trials and 168 CS− dual trials were performed (252 for participants with three fMRI sessions). In addition, 96 no-scene trials (T1-only) were collected for each participant (144 for participants with three fMRI sessions). To minimize the extinction of conditioned responses, three additional CS+ trials with US were present in each dual-task run (these were discarded from further analyses, too). Subjects were discouraged to guess “house” or “building” when unsure and were encouraged instead to use a third option (“no scene”) in such cases. Accordingly, few false alarms (i.e., “house” or “building” responses during T1-only trials) or incorrect scene categorization responses (i.e., “house” response in trials containing a building, or “building” response in trials containing a house) were observed (1.2 and 6.5% on average, respectively); these trials were excluded from further analyses (critically, no differences were observed between CS+ and CS− conditions). Anatomical and functional scans were acquired using a Siemens 3T TRIO scanner (Siemens Medical Systems, Erlangen, Germany) with an eight-channel phased-array head coil. Structural images were acquired first with a high resolution MPRAGE anatomical sequence (TR = 1900 ms; TE = 4.15 ms; TI = 1100 ms; 1-mm isotropic voxel; 256-mm field of view). Next, blood oxygenation level-dependent (BOLD) contrast functional images were acquired with gradient-echo echo-planar T2*-weighted imaging. Each functional volume consisted of 34 axial slices (TR = 2000 ms; TE = 25 ms; FA = 70°; field of view: 24 cm; 64 × 64 matrix; 3.8 mm thickness; interleaved acquisition order). Pre-processing of the fMRI data was performed using AFNI tools (Cox, 1996). The first six functional volumes of each run were removed to account for equilibration effects of magnetization. The following processing steps were applied: slice-time correction, motion correction, normalization to Talairach space, Gaussian spatial smoothing (full width at half maximum: 6 mm), and intensity normalization (each voxel’s mean was set to 100). Functional images acquired during the second (and third when needed) scanning session were aligned to those collected during the first scanning session by applying a transformation matrix determined by registering the second (and third when needed) anatomical dataset to the first session’s anatomical dataset. As our main goal was to assess the relationship between responses in pulvinar and behavior, to maximize statistical power, analyses were performed in a region of interest (ROI) based fashion. Left and right pulvinar ROIs were defined based on the standard anatomical mask of the pulvinar as provided by AFNI. Voxels were averaged together in each ROI to determine a representative time series. Prior to averaging the time series, the variance explained by reaction time was removed from the original time series of each voxel (slow-varying drifts in MR signal were likewise removed). Given our focus on understanding T2 performance, because we employed a slow event-related design, evoked responses of individual trials were based on the average of time points at 6 and 8 s post trial onset – i.e., 4–6 following T2 presentation (see Figure 2). Four trial types were of interest: HIT: correct trial containing a house/building stimulus, for both CS+ and CS− conditions; MISS: no-scene response for trials containing a house/building stimulus, for both CS+ and CS− conditions. A 2 × 2 repeated-measures ANOVA was run separately on left and right pulvinar ROI mean response data to probe both Conditioning (CS+, CS−) and Perceptual Decision (HIT vs. MISS) factors. Additional comparisons were evaluated via paired t tests. Figure 2. Pulvinar responses. (A–C) Left pulvinar responses. (A) Average time-courses of evoked responses in the left pulvinar ROI as a function of experimental condition. Evoked responses of individual trials were based on the average of time points at 6 and 8 s post trial onset (see shaded area) – i.e., 4–6 following T2 presentation (indicated schematically via the inset containing the house stimulus). (B) Bar plots showing the same data as in (A) based on the average of time points 6 and 8 s post trial onset. (C) Scatter plot illustrating the correlation between evoked responses in the left pulvinar ROI and behavioral performance across participants (percent correct difference). (D–F) Right pulvinar responses. Parts (D–F) correspond to parts (A–C), respectively. No error bars are included in (B,E) because our interest was on within-subject differences and, in particular, the within-subject interaction pattern. where y is the behavioral outcome (HIT:1, MISS: 0), the function logit−1 transforms continuous values to the range (0,1), which is necessary for probabilities (note that this is simply a logistic “sigmoidal” curve), fMRI is the response amplitude, and i is a trial index. The slope of the regression fit (b1) indicates the relative magnitude of the predictive effect. Group inferences were made by assessing logistic slopes across participants via one-sample and paired t tests (random effects). Note that the contrast of CS+ and CS− logistic regression slopes is functionally related to a Conditioning (CS+, CS−) × Perceptual Decision (HIT, MISS) statistical interaction. As described previously (Lim et al., 2009), T2 performance was 61.9% correct during CS− trials and 71.9% correct during CS+ trials [t(29) = 5.83, P < 0.001], revealing that the affective significance of a T2 target counteracted the attentional blink. Behavioral effects were observed regardless of the CS+ category [CS− house: 64.5%, CS+ building: 73.3%, t(14) = 3.27, P < 0.01; CS− building: 59.3%, CS+ house: 71.1%, t(14) = 4.72, P < 0.01]. Visual responses in the pulvinar ROIs were analyzed according to two Conditioning (CS+, CS−) by two Perceptual Decision (HIT, MISS) repeated-measures ANOVAs, one for each hemisphere (Table 1). For the left pulvinar (Figures 2A,B), a main effect of Perceptual Decision was detected, an effect that was qualified by a Conditioning by Perceptual Decision interaction that reflected greater differential HIT vs. MISS responses during the CS+ relative to the CS− condition. Subsequent tests revealed that evoked responses during HIT trials were stronger than during MISS trials for the CS+ condition [t(29) = 2.5, P < 0.05], but not the CS− condition [t(29) = 0.46, P = 0.65]. No differential responses as a function of affective significance (CS+ vs. CS−) were detected for HIT [t(29) = 1.6, P = 0.12] or MISS [t(29) = −0.85, P = 0.40] trials. Note also that no significant difference was detected between CS+ MISS vs. CS− HIT trials [t(29) = −1.21; P = 0.24]. For the right pulvinar (Figures 2D,E), only a main effect of Perceptual Decision was detected. Despite the absence of an interaction effect, we tested for simple effects given their theoretical importance and previous related findings in the amygdala and visual cortex (Lim et al., 2009), although caution is naturally needed when interpreting these results (Tybout and Sternthal, 2001). Responses during HIT trials were stronger than during MISS trials for the CS+ condition [t(29) = 2.72, P < 0.05], but not for the CS− condition [t(29) = 0.88, P = 0.39]. Furthermore, responses evoked during HIT trials were stronger for affectively significant stimuli [CS+ vs. CS−; t(29) = 2.34, P < 0.05], but no significant difference was observed during MISS trials [t(29) = 0.09, P = 0.93]. The latter result reveals that affective modulation of evoked responses was tied to visual perception, i.e., occurred only when subjects correctly detected T2 scenes. To explore the relationship between responses evoked in the pulvinar and T2 behavioral performance, we conducted a correlation analysis (across individuals). Differential responses to HITS (CS+ vs. CS−) were significantly correlated with improvements in T2 performance (CS+ vs. CS−) in the left [Figure 2C; r(30) = 0.42, P < 0.05] and right pulvinar [Figure 2F; r(30) = 0.46, P < 0.01]. If signals in the pulvinar are closely linked to behavioral performance, fluctuations in evoked responses should be predictive of trial-by-trial T2 detection performance. To evaluate this prediction, we performed logistic regression analysis and modeled the probability of a HIT trial as a function of single-trial amplitude. Logistic fits from sample individuals are shown in Figures 3A,C for the left and right pulvinar, respectively. At the group level, the mean logistic regression slopes, which represent the strength of the predictive effect, were significantly greater than 0 for CS+ trials in both left and right pulvinar, indicating that trial-by-trial fluctuations in fMRI signals reliably predicted perceptual T2 decisions (Figures 3B,D; Table 2). In the left pulvinar, a direct comparison of the CS+ and CS− conditions (see the last bar in Figures 3B,D) revealed that the predictive power of the logistic regression fit was stronger during CS+ relative to CS− scenes [t(29) = 2.55, P < 0.05]; no significant difference was detected in the right pulvinar [t(29) = 1.26, P = 0.22]. Figure 3. Trial-by-trial analysis of hit vs. miss trials. (A,B) Left pulvinar. (A) Logistic regression analysis of evoked responses in the left pulvinar ROI as a function of affective significance (CS+ and CS−) for a sample individual. The slope of the logistic fit indicates the strength of the predictive effect. For clarity, only binned data for the CS+ condition are shown (black dots). (B) Mean logistic slopes across individuals for the left pulvinar. (C,D) Right pulvinar. Parts (C,D) correspond to parts (A,B), respectively. Error bars in (B,D) are 95% confidence intervals around the mean. Table 2. Trial-by-trial analysis of HIT vs. MISS trials in the Pulvinar. Mean logistic slopes are provided (P-values in parentheses; values in bold font are statistically significant at the 0.05 level). In this investigation, we probed pulvinar responses with the goal of characterizing how they are linked to affective processing and stimulus visibility during resource-poor conditions. Pulvinar responses were evaluated in two ways, first in terms of mean responses (via ANOVAs) and in terms of trial-by-trial response fluctuations (via logistic regression). The mean-response analysis revealed that pulvinar responses were not influenced by affective significance (CS+ vs. CS−) per se, but that they were closely tied to perception (HIT vs. MISS). Notably, a Conditioning by Perceptual Decision interaction was detected for the left pulvinar (because of greater differential HIT vs. MISS responses during the CS+ relative to the CS− condition). The trial-by-trial analysis revealed that moment-to-moment fluctuations in response magnitude followed trial-by-trial detection performance, and thereby closely tracked target visibility. Logistic regression slopes differed as a function of affective significance (CS+ vs. CS−) for the left pulvinar, a result that paralleled the Conditioning by Perceptual Decision interaction observed in the ANOVA (note that logistic regression slopes are based on considering both HIT and MISS trials). The logistic regression analysis summarized how trial-by-trial fluctuations in response strength were linked to behavioral performance. Another aspect of the link between pulvinar responses and behavior was investigated by considering the influence of affective significance on mean responses. Participants with larger differential responses during HIT trials (CS+ vs. CS−) exhibited a correspondingly larger behavioral improvement. These results, which were observed in both left and right hemispheres, are consistent with the notion that improvements in behavioral performance were linked to how affective significance enhanced evoked responses in the pulvinar during HIT trials. Some of our findings differed between the left and right pulvinar. The significance of the differences is unclear at the moment, but it is noteworthy that both hemispheres exhibited brain–behavior correlations (Figures 2C,F). In addition, across individuals, trial-by-trial fluctuations in evoked responses in both hemispheres tracked stimulus visibility during the CS+ condition (Figures 3B,D). 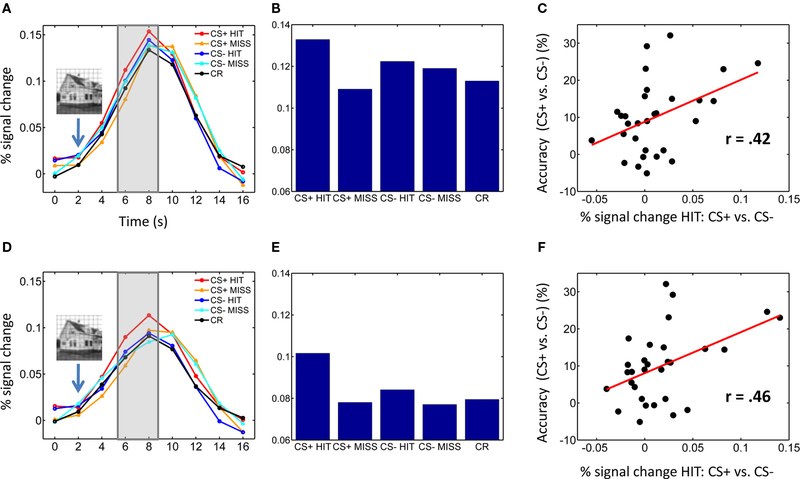 In our previous report, the comparison between CS+ and CS− MISS trials did not reveal significant differential responses in the amygdala or visual cortex (Lim et al., 2009). Contrary to suggestions of stronger automaticity of emotion-laden stimuli, the affective nature of a stimulus itself did not guarantee robust differential responses, which indicates that affective perception is under the control of attentional mechanisms during temporal “bottleneck” conditions (Stein et al., 2010) – in addition to during spatial manipulations of attention (Pessoa, 2005). Because of these prior results and their theoretical importance, here we probed responses during MISS trials, too. No significant differences were observed in the left or right pulvinar. These results are of particular importance in the context of the putative subcortical pathway, as one of its central properties is that it conveys information rapidly and independently of attention and awareness. Our results are thus inconsistent with a “strongly automatic” view of pulvinar function, one that is often encountered in the context of affective processing. Broadly speaking, the interpretation of findings of the attentional blink in general (i.e., not only in affective paradigms) is complex because both attention and awareness are involved in the paradigm (Bowman and Wyble, 2007; Shapiro, 2009; Martens and Wyble, 2010), and it is becoming increasingly clear that even though attention and awareness are related, they may also be partially dissociated (Lau and Passingham, 2006; Koch and Tsuchiya, 2007). For instance, attention can affect perceptual processing and behavioral performance in the absence of awareness (Kentridge et al., 2004; Bahrami et al., 2007). Here, although pulvinar responses tracked stimulus visibility, it was not possible to disentangle the contributions of the pulvinar to attention and awareness processes. In the present study, as well as in our previous report (Lim et al., 2009), we focused on specific regions of interest given a priori questions of theoretical and empirical importance. Accordingly, we do not claim that the present findings are specific to the pulvinar. Indeed, many of the present results paralleled those observed in the amygdala and visual cortex, where trial-by-trial fluctuations in response magnitude closely tracked behavioral performance. More broadly, we anticipate that other brain regions may exhibit similar patterns of results, for instance attentional regions in frontal and parietal cortices given that responses in these regions have been shown to be closely linked to task performance (Pessoa et al., 2002; Marois and Ivanoff, 2005). It could be argued that a role for the pulvinar in subcortical affective processing is not adequately tested in the present study because of the choice of stimuli employed. In other words, because the detection of the second target involved a house vs. building discrimination, detailed form processing may have been involved – and would presumably not be conveyed subcortically. Note, however, that our stimuli were selected so as to be easily discriminable. Specifically, on the one hand, building stimuli involved images with a clear vertical elongation; houses, on the other hand, lacked this type of asymmetry. 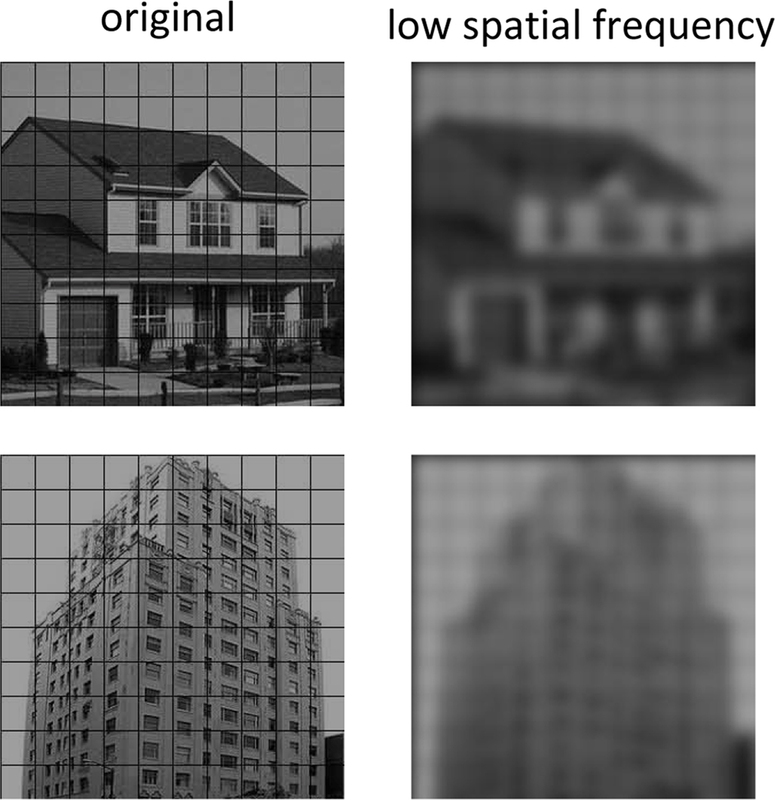 Consistent with the suggestion that the categories did not require detailed visual information to be told apart, low spatial-frequency versions of our stimuli are easily discriminated from each other (see Figure 4 for an example). Nevertheless, because of the stimuli adopted here, the present study is unable to assess the suggestion that the purported subcortical pathway is involved in the processing of “biologically prepared” stimuli (Ohman and Mineka, 2001). Along related lines, the present study employed a differential conditioning procedure that is more complex than some of the conditioning procedures employed in the animal literature (LeDoux, 1996). Accordingly, it would be of value to test variants of the procedure employed here that utilized simpler conditioning procedures. Figure 4. Frequency content of T2 stimuli. Original and low spatial frequency content of typical house and building T2 stimuli used in this study. It is apparent that house and building stimuli can be discriminated easily based on low spatial frequency information alone. In the low-pass images, building stimuli exhibit a clear vertical elongation; houses, on the other hand, lacked this type of asymmetry. In the present study, behaviorally, the detection of the second target occurred more frequently during the CS+ compared to the CS− condition. What are the circuits by which affective significance influenced perception? Although our study does not answer this question, we suggest the following working hypothesis. In our task, the effect of emotion necessitates the categorization of buildings and houses, a process that likely depends on territories in ventral occipitotemporal cortex. Information from anterior aspects of the ventral visual stream is then conveyed to the amygdala (Amaral et al., 1992) – thus completing a “feedforward sweep.” The amygdala is suggested, then, to play a key role in determining the affective value of incoming stimuli (including houses and buildings in our task), and in modulating visual activation based on this assessment (Vuilleumier et al., 2004). More generally speaking, what is the role of the pulvinar in emotion? Studies by Ward and colleagues help illuminate potential roles of the pulvinar during affective processing. For instance, a complete unilateral loss of the pulvinar led to a severe deficit in a patient’s ability to recognize fearful expressions shown in the contralesional field (Ward et al., 2007). In an earlier study, viewing complex unpleasant images impaired a subsequent simple (neutral) visual task in controls, but not in a patient with pulvinar damage (Ward et al., 2005) – compatible with the idea that the unpleasant stimulus did not garner additional resources in the patient, which would have interfered with performance, as in the controls. Taken together with the broader literature on the role of the pulvinar in attention and awareness, we propose the following working hypothesis for the function of the pulvinar in emotion. Broadly speaking, the role of the pulvinar in emotion is integrative (see also Shipp, 2003; Ward et al., 2007). In particular, the medial pulvinar is interconnected with large portions of the cortex, including parietal, frontal, insular, orbital, and cingulate cortices (Grieve et al., 2000; Shipp, 2003) – in addition to being connected to the amygdala (Jones and Burton, 1976; Romanski et al., 1997). As part of thalamocortical loops with all these diverse cortical territories, the medial pulvinar is thus well positioned to influence the flow of information processing in the brain according to a stimulus’s biological significance (note that the medial pulvinar needs to be distinguished from the inferior pulvinar, the latter being more closely associated with visual functions; see Grieve et al., 2000; Shipp, 2003 and Figure 5). In particular, when weak and/or brief visual stimuli have affective significance, cortico-pulvino-cortical circuits may act such that signals are coordinated and amplified in a manner that will enhance their behavioral impact (Figure 5). In the present study, the pulvinar’s contribution to affective processing was discernible in several ways. As stated previously, at the average response level, increased response to HIT trials during the CS+ condition relative to the CS− condition was correlated with behavioral performance. Furthermore, in the left pulvinar, a Conditioning by Perceptual Decision interaction was observed, reflecting a larger differential response to HITS vs. MISSES for affectively significant (CS+) stimuli. The same relationship was also evident at the trial-by-trial level, as the slopes of the logistic fits were significantly steeper for CS+ stimuli (in the left pulvinar). Our findings thus reveal important interactions between emotional content and perception in the pulvinar. Figure 5. Affective significance and the pulvinar. When weak, though affectively significant stimuli are encountered (as shown in the inset), interactions between the medial (Med) pulvinar and several brain regions important for the determination of “biological value” influence the flow of information processing, such that signals related to such items are amplified, thus leading to increased behavioral effects. 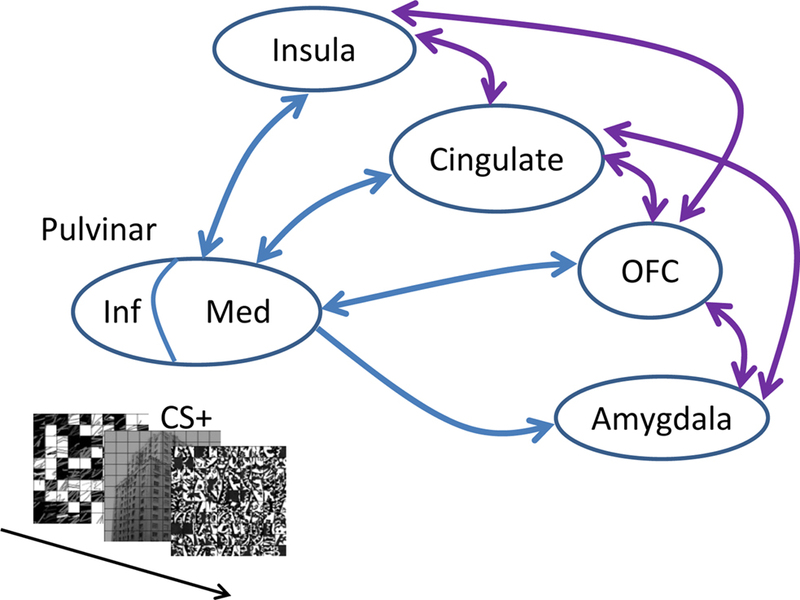 Note that only some of the connections between the amygdala, orbitofrontal cortex (OFC), cingulate, and insula are provided (shown in purple). In contrast to the medial pulvinar, which is largely “associational,” the inferior (Inf) pulvinar is bidirectionally connected with striate and extra-striate cortex, and is thus much more “visual”. In conclusion, our results do not support a passive role of the pulvinar in affective processing, as often invoked in the context of the subcortical-pathway hypothesis (for further discussion, see Pessoa, 2005). Instead, the pulvinar appears to be involved in mechanisms that are closely linked to attention and awareness, a role that may be particularly important during the processing of affectively significant stimuli. Support for this work was provided in part by the National Institute of Mental Health (R01 MH071589) and the Indiana METACyt Initiative of Indiana University, funded in part through a major grant from the Lilly Endowment, Inc. We thank the anonymous reviewers for valuable feedback on an earlier version of the manuscript. Amaral, D. G., Price, J. L., Pitkanen, A., and Carmichael, S. T. (1992). “Anatomical organization of the primate amygdaloid complex,” in The Amygdala: Neurobiological Aspects of Emotion, Memory, and Mental Dysfunction, ed. J. Aggleton (New York: Wiley-Liss), 1–66. Arend, I., Machado, L., Ward, R., McGrath, M., Ro, T., and Rafal, R. D. (2008). The role of the human pulvinar in visual attention and action: evidence from temporal-order judgment, saccade decision, and antisaccade tasks. Prog. Brain Res. 171, 475–483. Bahrami, B., Lavie, N., and Rees, G. (2007). Attentional load modulates responses of human primary visual cortex to invisible stimuli. Curr. Biol. 17, 509–513. Benevento, L. A., and Port, J. D. (1995). Single neurons with both form/color differential responses and saccade-related responses in the nonretinotopic pulvinar of the behaving macaque monkey. Vis. Neurosci. 12, 523–544. Bowman, H., and Wyble, B. (2007). The simultaneous type, serial token model of temporal attention and working memory. Psychol. Rev. 114, 38–70. Corbetta, M., Miezin, F. M., Dobmeyer, S., Shulman, G. L., and Petersen, S. E. (1991). Selective and divided attention during visual discriminations of shape, color, and speed: functional anatomy by positron emission tomography. J. Neurosci. 11, 2382–2402. de Gelder, B., Vroomen, J., Pourtois, G., and Weiskrantz, L. (1999). Non-conscious recognition of affect in the absence of striate cortex. Neuroreport 10, 3759–3763. Desimone, R., Wessinger, M., Thomas, L., and Schneider, W. (1990). Attentional control of visual perception: cortical and subcortical mechanisms. Cold Spring Harb. Symp. Quant. Biol. 55, 963–971. Grieve, K. L., Acuna, C., and Cudeiro, J. (2000). The primate pulvinar nuclei: vision and action. Trends Neurosci. 23, 35–39. Hosmer, D. W., and Lemeshow, S. (2000). Applied logistic Regression, 2nd Edn. New York: John Wiley & Sons, Inc.
Jones, E. G., and Burton, H. (1976). A projection from the medial pulvinar to the amygdala in primates. Brain Res. 104, 142–147. Karnath, H. O., Himmelbach, M., and Rorden, C. (2002). The subcortical anatomy of human spatial neglect: putamen, caudate nucleus and pulvinar. Brain 125, 350–360. Kastner, S., O’Connor, D. H., Fukui, M. M., Fehd, H. M., Herwig, U., and Pinsk, M. A. (2004). Functional imaging of the human lateral geniculate nucleus and pulvinar. J. Neurophysiol. 91, 438–448. Kentridge, R. W., Heywood, C. A., and Weiskrantz, L. (2004). Spatial attention speeds discrimination without awareness in blindsight. Neuropsychologia 42, 831–835. Koch, C., and Tsuchiya, N. (2007). Attention and consciousness: two distinct brain processes. Trends Cogn. Sci. 11, 16–22. LaBerge, D., and Buchsbaum, M. S. (1990). Positron emission tomographic measurements of pulvinar activity during an attention task. J. Neurosci. 10, 613–619. Lau, H. C., and Passingham, R. E. (2006). Relative blindsight in normal observers and the neural correlate of visual consciousness. Proc. Natl. Acad. Sci. U.S.A. 103, 18763–18768. Lundqvist, D., Flykt, A., and Öhman, A. (1998). The Karolinska Directed Emotional Faces. Stockholm: Karolinska Institute. Marois, R., Chun, M. M., and Gore, J. C. (2004). A common parieto-frontal network is recruited under both low visibility and high perceptual interference conditions. J. Neurophysiol. 92, 2985–2992. Marois, R., and Ivanoff, J. (2005). Capacity limits of information processing in the brain. Trends Cogn. Sci. 9, 296–305. Mesulam, M. M. (1981). A cortical network for directed attention and unilateral neglect. Ann. Neurol. 10, 309–325. Morris, J. S., DeGelder, B., Weiskrantz, L., and Dolan, R. J. (2001). Differential extrageniculostriate and amygdala responses to presentation of emotional faces in a cortically blind field. Brain 124, 1241–1252. Ohman, A., Lundqvist, D., and Esteves, F. (2001). The face in the crowd revisited: a threat advantage with schematic stimuli. J. Pers. Soc. Psychol. 80, 381–396. Ohman, A., and Mineka, S. (2001). Fears, phobias, and preparedness: toward an evolved module of fear and fear learning. Psychol. Rev. 108, 483–522. Pessoa, L. (2005). To what extent are emotional visual stimuli processed without attention and awareness? Curr. Opin. Neurobiol. 15, 188–196. Pessoa, L., Gutierrez, E., Bandettini, P., and Ungerleider, L. (2002). 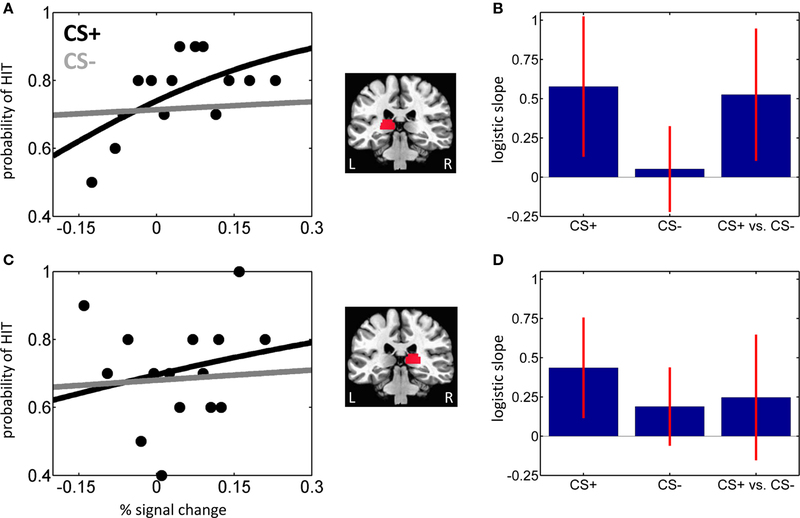 Neural correlates of visual working memory: fMRI amplitude predicts task performance. Neuron 35, 975–987. Petersen, S. E., Robinson, D. L., and Keys, W. (1985). Pulvinar nuclei of the behaving rhesus monkey: visual responses and their modulation. J. Neurophysiol. 54, 867–886. Robinson, D. L., and Cowie, R. J. (1997). “The primate pulvinar: structural, functional, and behavioral components of visual salience,” in The Thalamus, ed. D. McCormick (New York, NY: Elsevier), 53–92. Shapiro, K. (2009). The functional architecture of divided visual attention. Prog. Brain Res. 176, 101–121. Shipp, S. (2003). The functional logic of cortico-pulvinar connections. Philos. Trans. R. Soc. Lond., B, Biol. Sci. 358, 1605–1624. Stein, T., Peelen, M. V., Funk, J., and Seidl, K. N. (2010). The fearful-face advantage is modulated by task demands: evidence from the attentional blink. Emotion 10, 136–140. Tybout, A., and Sternthal, B. (2001). Can I test for simple effects in the presence of an insignificant interaction? J. Consum. Psychol. 10, 5–10. Ungerleider, L. G., and Christensen, C. A. (1979). Pulvinar lesions in monkeys produce abnormal scanning of a complex visual array. Neuropsychologia 17, 493–501. Vuilleumier, P., Richardson, M. P., Armony, J. L., Driver, J., and Dolan, R. J. (2004). Distant influences of amygdala lesion on visual cortical activation during emotional face processing. Nat. Neurosci. 7, 1271–1278. Ward, R., Calder, A. J., Parker, M., and Arend, I. (2007). Emotion recognition following human pulvinar damage. Neuropsychologia 45, 1973–1978. Ward, R., Danziger, S., and Bamford, S. (2005). Response to visual threat following damage to the pulvinar. Curr. Biol. 15, 571–573. Ward, R., Danziger, S., Owen, V., and Rafal, R. (2002). Deficits in spatial coding and feature binding following damage to spatiotopic maps in the human pulvinar. Nat. Neurosci. 5, 99–100. Wilke, M., Mueller, K. M., and Leopold, D. A. (2009). Neural activity in the visual thalamus reflects perceptual suppression. Proc. Natl. Acad. Sci. U.S.A. 106, 9465–9470. Zihl, J., and von Cramon, D. (1979). The contribution of the ‘second’ visual system to directed visual attention in man. Brain 102, 835–856. Accepted: 20 July 2010; Published online: 24 September 2010. Copyright: © 2010 Padmala, Lim and Pessoa. This is an open-access article subject to an exclusive license agreement between the authors and the Frontiers Research Foundation, which permits unrestricted use, distribution, and reproduction in any medium, provided the original authors and source are credited.